Sonoma County Harvest Fair amateur winemaking competition results are posted. It's official, the Italian husband has pulled off a double gold for Best of Class in the hobby Syrah stakes. Not that this will swell his head or anything. Certainly raises the rarity value of his limited production, handcrafted 2008 backyard vintage. 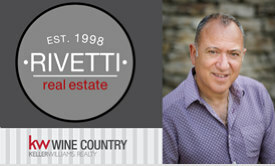 "The quality of the fruit, coupled with sound fermentation practices, introduction of an imported French yeast designed specifically for Syrah (thank you, Doug Cover) and the fact that these grapes never leave the property at any stage of the winemaking process has produced a stellar result for my fifth vintage," says Rivetti, who has, now, officially locked us all out of the wine storage closet, tucked away under the stairs. Yikes! I guess I can now say I knew you all when?!!! ?